South Netherlandish family of painters. Active in both Tournai and Brussels, Rogier van der Weyden was one of the most renowned painters of the 15th century, though his reputation declined after the loss of important works in the 17th century and is only now being reinstated. 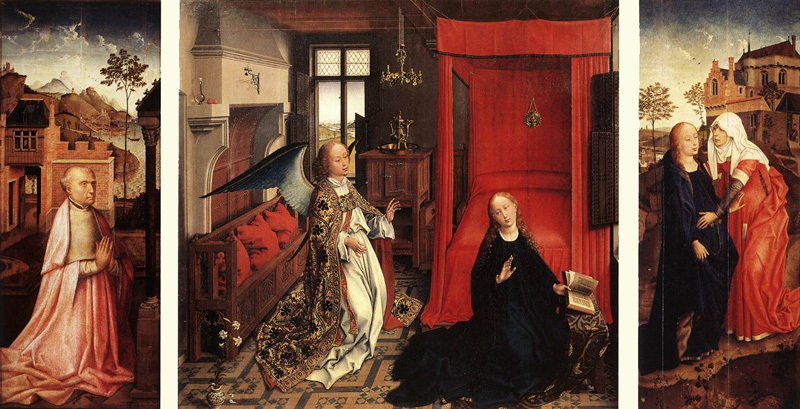 He was probably trained by the Master of Flemalle and he also clearly knew the work of Jan van Eyck; his interests differed from theirs, however, and he became increasingly concerned with developing the emotional impact of his religious paintings. He was also an innovative and influential portrait painter. Rogier apparently established a large workshop and had many imitators, but none achieved the subtlety and expressive power of his paintings. His son Pieter van der Weyden is usually identified with the anonymous MASTER OF THE LEGEND OF ST CATHERINE, a painter active in Brussels c. 1470–1500. Pieter’s son Goswijn van der Weyden presumably trained with his father and grew up in Brussels in an artistic circle deeply imbued with the stylistic influence of his famous grandfather. (b Tournai, c. 1399; d Brussels, 18 June 1464). 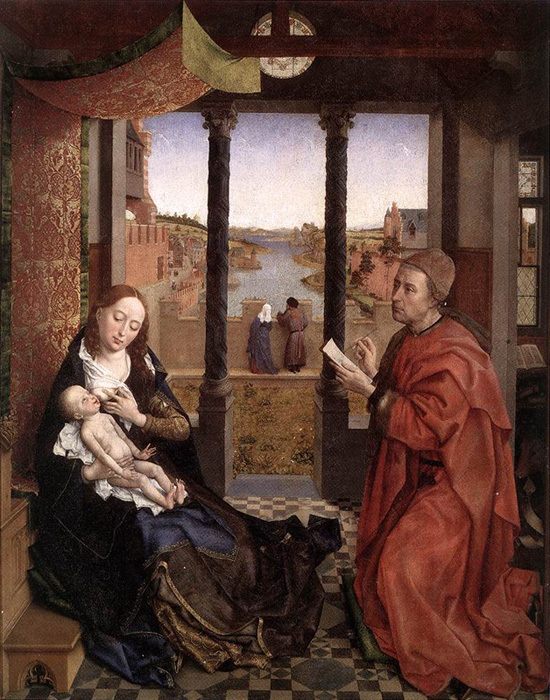 Rogier van der Weyden was the son of Henri de le Pasture, a cutler in Tournai, and Agnès de Watreloz. His birthdate is estimated from the facts that he was stated to be 35 in April 1435 and 43 in September 1441. Before or in 1427 he married Elisabeth Goffaert (c. 1405–77), whose father was a prosperous shoemaker in Brussels. Rogier may have lived for a time in Brussels: his eldest child Cornelis (b 1427) was sometimes referred to as ‘de Bruxella’ but was not necessarily a native of Brussels. On 5 March 1427 ‘Rogelet de le Pasture, natif de Tournai’ was apprenticed to the Tournai painter Robert Campin. This Rogelet duly completed his apprenticeship in 1431 and on 1 August 1432 became a master of the Tournai guild. 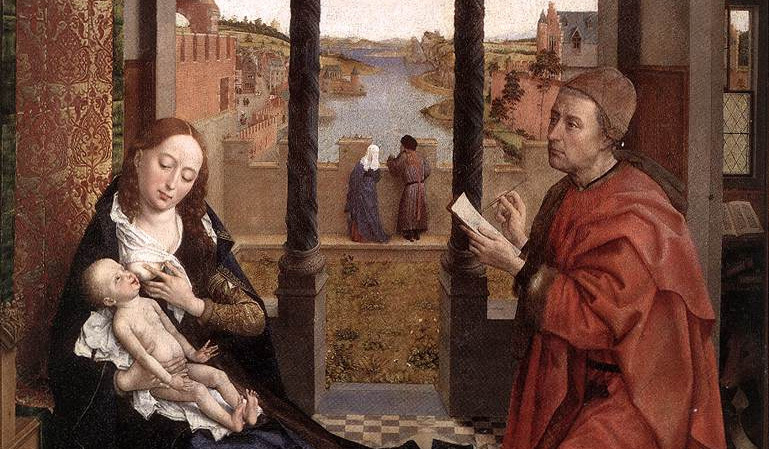 Despite much debate, it would appear that Rogelet was Rogier van der Weyden, though it has also been argued that in 1427 Rogier was a married man well past the normal age of apprenticeship and that Rogelet must have been a second Tournai painter of the same name. JACQUES DARET, however, was in his twenties when in 1428 he was apprenticed to Campin, and other instances can be cited of married apprentices. The political situation at Tournai in 1427–8 was unusual, and the guild system was not functioning normally. Van der Weyden maintained connections with Tournai and the Tournai guild of painters, which in 1464 held a funeral service in his honour. It would seem that Rogier and Rogelet were indeed the same person. French Rogier De La Pasture Flemish painter who, with the possible exception of Jan van Eyck, was the most influential northern European artist of his time. Though most of his work was religious, he produced secular paintings (now lost) and some sensitive portraits. Rogier was the son of a master cutler,and his childhood must have been spent in the comfortable surroundings of the rising class of merchants and craftsmen. He may even have acquired a university education, for in 1426 he was honouredby the city as “Maistre (Master) Rogier de la Pasture” and began his painting career only the next year at the rather advanced age of 27. 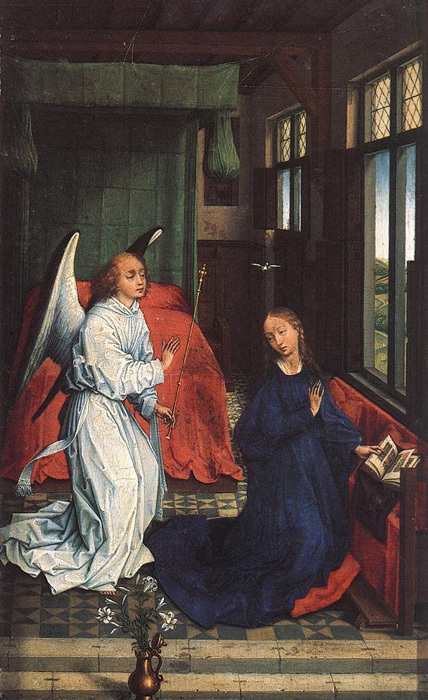 It was then, on March 5, 1427, that Rogier enrolled as an apprentice in the workshop of Robert Campin, the foremost painter in Tournai and dean of the painters' guild. Rogier remained in Campin's atelier for five years, becoming an independent master of the guild on Aug. 1, 1432. From Campin, Rogier learned the ponderous, detailed realism that characterizes his earliest paintings, and so alike, in fact, are the styles of these two masters that connoisseurs still do not agree on the attribution of certain works. But the theory that the entire sequence of paintings credited to Campin (who, like Rogier, did not sign his panels) are actually from the brush of the young Rogier cannot be maintained. Careful study of secure works by Rogier and by his colleague in Campin's workshop, Jacques Daret, permit scholars to reestablish a basic series of works by the older master and to distinguish the style of these from that of Rogier. Campin was not the only source of inspiration in Rogier's art. Jan van Eyck, the great painter from Bruges, also profoundly affected the developing artist, introducing elegance and subtle visual refinements into the bolder, Campinesque components of such early paintings by Rogier as “St. Luke Painting the Virgin.” Although as an apprentice Rogier must certainly have met Jan van Eyck when the latter visited Tournai in 1427, it was more likely in Bruges, where Rogier may have resided between 1432 and 1435, that he became thoroughly acquainted with van Eyck's style. By 1435, Rogier, now a mature master, settled in Brussels, the native city of his wife, Elizabeth Goffaert, whom he had married in 1426. The next year he was appointed city painter; and it was from this time that he began to use the Flemish translation of his name (van der Weyden). Rogierremained in Brussels the rest of his life, although he never completely severed his ties with Tournai. He was commissioned to paint a mural (now destroyed) for the town hall of Brussels showing famous historical examples of the administration of justice. 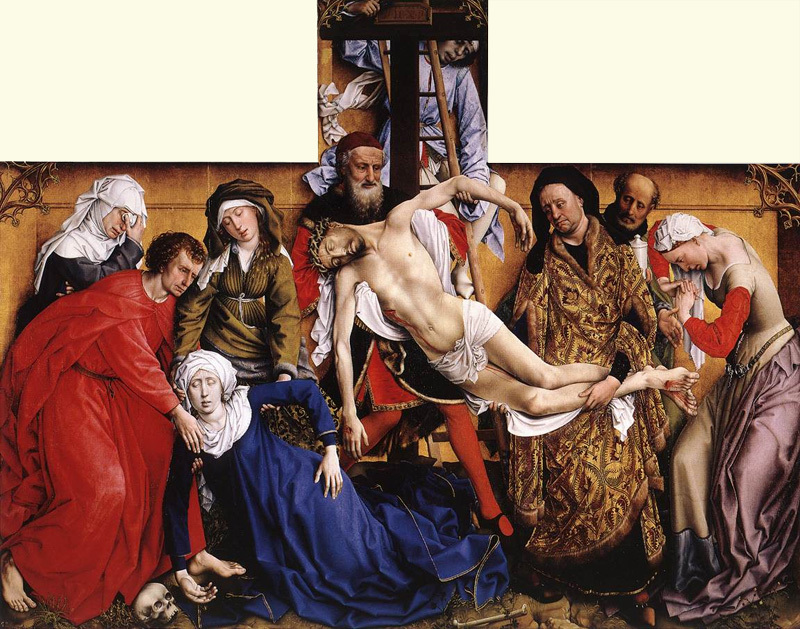 During this same period, around 1435–40, he completed the celebrated panel of the “Descentfrom the Cross” (see ) for the chapel of the Archers' Guild of Louvain. In this deposition there is evident a tendency to reduce the setting of a scene to a shallow, shrinelike enclosure and to orchestrate a rich diversity of emotions. These devotional qualities are even more striking in Rogier's works of the 1440s such as the twin “Granada-Miraflores” altarpieces and the “Last Judgment Polyptych” in Beaune, Fr. (Hôtel-Dieu). In these the settings are stark, the figures are delicate Gothic types, and the action, though stilled, is exquisitely expressive. The removalof Rogier's art from concern with outward appearances and his return to medieval conventions is surprising; for it was during this decade that Rogier's international reputation was secured and commissions increased from noblemen such as Philip the Good, duke of Burgundy, and his powerful chancellor, Nicolas Rolin. Rogier may well have also been influenced by the writings of Thomas à Kempis, the most popular theologian of the era, whose “practical mysticism,” like Rogier's painting, stressed empathetic response to episodes from the lives of Mary, Christ, and the saints. Perhaps as an extension of a journey to install the “Last Judgment Altarpiece” in Rolin's chapel at Beaune or possibly to obtain a plenary indulgence for his daughter Margaret, oneof Rogier's four children, who had died that year, the renowned painter visited Rome during the Jubilee of 1450. He was warmly received in Italy. Praise from the Humanist Bartolomeo Fazio and the eminent theologian Nicholas of Cusa is recorded; Rogier also received commissions from the powerful Este family of Ferrara and the Medici of Florence. He painted a portrait of Francesco d'Este (originallythought to be Leonello d'Este), and his painting of the Madonna and Child that still remains in Florence (Uffizi) bears the arms and patron saints of the Medici. While on his pilgrimage, Rogier apparently tutored Italian masters in painting with oils, a technique in which Flemish painters of the time were particularly adept. He also seems to have learned a great deal from what he viewed. Although he was primarily attracted to the conservative painters Gentile da Fabriano and Fra Angelico, whose medievalizing styles paralleled his own, Rogier was also acquainted with more progressive trends. In the “St. John Altarpiece” and the “Seven Sacraments Triptych,” executed between 1451 and 1455, shortly after Rogier's return north, his characteristic austerity is tempered by his recollection of the more robust Italian styles; and, in both, the panels are unified from a single point of view. Despite this enrichment, however, Rogier's conceptions remained essentially iconic: he pushed the figures into the foreground and isolated them from their surroundings as subjects for devotion. The last 15 years of his life brought Rogier the rewards due an internationally famous painter and exemplary citizen. He received numerous commissions, which he carried out with the assistance of a large workshop that included his own son Peter and his successor as city painter, Vranck van der Stockt, a mediocre imitator. Even before his death, however, Rogier's impact extended far beyond his immediate associates. 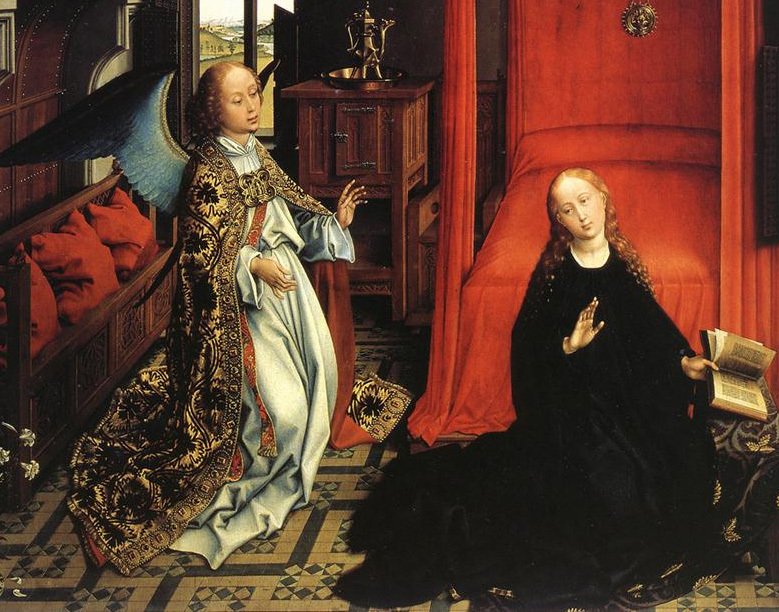 The influence of his expressive but technically less intricate style eclipsed that of both Campin and van Eyck. Every Flemish painter of the succeeding generation—Petrus Christus, Dirck Bouts, Hugo van der Goes, and Hans Memling (who may have studied in Rogier's atelier)—depended on his formulations; and, during the 16th century, Rogierian ideas were transformed and revitalized by Quinten Massys and Bernard van Orley. Rogier's art was also a vehicle for transporting the Flemish style throughout Europe, and during the second half of the 15th century his influence dominated painting in France, Germany, and Spain. Nevertheless, the fame of Rogier van der Weyden quicklywaned, and no painting by him had been signed or dated. By the end of the 16th century the biographer Carel van Mander had referred mistakenly to two Rogiers in Het Schilderboek (1603; “Book of Painters”), and by the middle of the 19th century his fame and art had all but been forgotten. Only through a meticulous evaluation of the documents have scholars over the past century been able to reconstruct Rogier's work and to restore the reputation of one of 15th-century Flanders' leading masters.